Organisers of Manchester’s unsigned music festival Raw Fest presented cheques worth over £3,000 to two industry charities at a star-studded ceremony on 26th September at Band on the Wall. Production suppliers and training centre Backstage Academy supported the festival at Jackson’s Boat in Manchester on June 15 to raise money for charities that help disadvantaged and underprivileged groups launch careers in music and backstage production. The second annual outdoor event grew threefold to welcome almost 1,000 people to the historic inn on the banks of the River Mersey in Sale this year, with Mr Scruff as the guest headliner supporting a line-up of 20 up and coming acts. The event supports unsigned artists and gives them a platform to perform in a professional festival environment. LS-Live supplied its Mini Stage for the main performances and STS Touring, HSL, Euro Generators UK and Loop Insurance also provided equipment and services to the festival back in June. Backstage Academy students got the chance to run a festival production, setting up the stage, rigging lighting and sound equipment, and taking on various roles in production throughout the day, under the supervision of technical director Gareth Welbourn. Legendary TV star and producer David Gest hosted the celebration event, which featured Gwen Dickey (of ‘Car Wash’ fame), Aswad’s Brinsley Forde and up and coming talent. The night marked the launch of the Band on the Wall Foundation – one of the donor charities run by the live music venue. 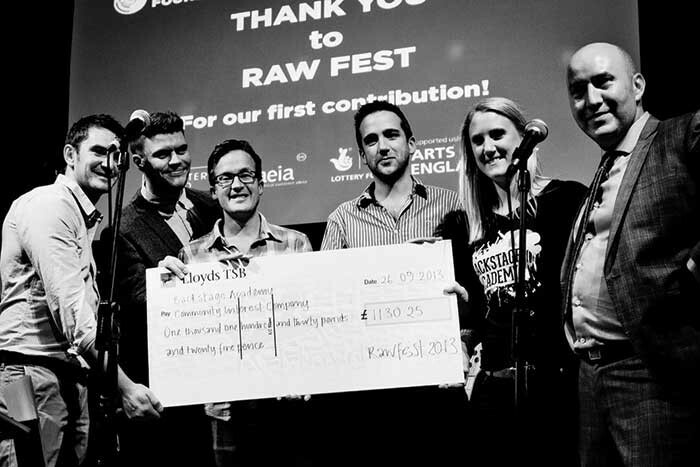 Raw Fest donated over £2,000 to the Band on the Wall Foundation, which aims to work with communities facing social challenges to provide an accessible music programme and a sustainable learning centre for young people and emerging musicians. It also presented over £1,000 to Backstage Academy Community Interest Company, which funds training and employment programmes for disadvantaged groups across communities to provide them with the opportunity to develop careers in live events production. Backstage Academy’s Tcharn Clabburn was one of the 15 students who worked on the production on the event. He said: "Raw Fest was a really good day and one of the best opportunities I’ve had on the course so far as we got some real hands-on experience. I set up the sound system on the main stage and was left to mix the FOH and monitor mix for the artists from main stage FOH which was great." The money donated to Backstage Academy CIC will be put towards its current Scholarship opportunities for the Ready for Work Training Programmes in December, which includes a number of short course certificates to help people who need support to get a foot on the career ladder of backstage live production. Said Backstage Academy’s Gareth Welbourn: "Raw Fest gave us the perfect opportunity to allow our students to put their knowledge and skills they’ve learnt on the course into practice in a festival environment. They were given a lot of responsibility and responded very well to the challenges the event threw up. "We are grateful to Raw Fest for donating some of the profits back to our CIC and the money will go to a great cause." One of the performers at Raw Fest, urban artist Brad The Processor Bromley, founded his music career after attending workshops at Band on the Wall with BrighterSounds one of B.O.T.W`s Foundations. It was through this network that he met other artists and was given the inspiration to get a studio together and start acting like a professional artist. Said Brad The Processor Bromley: "Band on the Wall’s delivery partner BrighterSound helped me get my music back on track and I’ve played lots of gigs at their venue. They gave me the skills I needed to perform and get gigs such as the Royal Opera House, which led to performing in Sweden Trastock Festival, Blaze Festival and also Raw Fest." He played alongside Krisshan Jade, Rum Thief, Chesqua and DJ collectives Engine, Roots Before Branches and Bad Habit in the marquee, whilst the main stage hosted Manchester’s soulful four-piece Black Lights, Salford’s comedic feel-good band Thingumabob & The Thingumajigs, psychedelic pop group The Chanteuse & The Crippled Claw, Irish songstress Shauna Mackin, Second Hand Wings and Thugs on Wolves. Brad continued: "Raw Fest was a vibed up day and brought together lots of aspiring artists who love music. When I first saw the tent it turned my stomach a little as it was quieter than the main stage, but when people heard us they all piled in and the gig was exactly as I wanted it to be because there’s no other feeling that makes you get motivated to do more, better, bigger things than when you have a crowd buzzing off your talent and music. In picture: Raw Fest team presents cheque to Backstage Academy. Photo: Tom Gradwell.